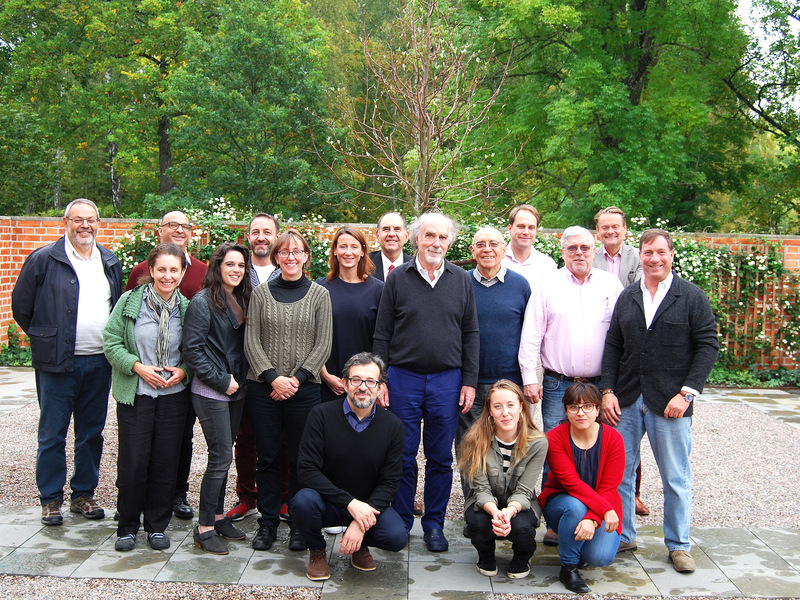 In late September 2017, a distinguished and diverse small group of scientists, architects, urban designers, design consultants, software engineers, and hardware manufacturers met in Engelsberg, Sweden, hosted by the Ax:son Johnson Foundation. The purpose of the meeting was to talk about improving the collection and analysis of data recording how people react to space and place. A hope behind the meeting is that a substantial body of better and more sophisticated data than we have now will transform the way we understand and design places from the scale of the city to the building. An informal report about the event follows below. Before the meeting, information for attendees was posted at this site. The sequence of events that led to the meeting in Engelsberg began when John Massengale and Ann Sussman individually spoke at the same planning conference in New England. Both saw a large overlap between Massengale’s professional interest in urban design, architecture, and placemaking and the ideas in Sussman’s book Cognitive Architecture. Trying to work together, they brainstormed with colleagues, potential clients, and possible funders and simultaneously found enormous interest and a problem of “silos”—because of a lack of funding, no one was adequately paid for the time and resources the work required. Bringing experts from other fields in as paid consultants was usually impossible. As a result, there was a lot of talk and theory (and academic conferences), but little reliable data. Sussman was familiar with both sides of the issue. With a grant of $1,500, she could make a short eye-tracking study, but that left no money for consultations with scientists or hiring Photoshop experts. Nevertheless, the information from the underfunded study could lead to a cover story in Planning magazine and stories and op-eds in the Boston Globe. Teaching for a week at the Centre for the Future of Places at the Royal Technological Institute in Stockholm (KTH), Massengale approached Peter Elmlund at the Ax:son Johnson Foundation, which funds the Centre and other urban research projects. Elmlund agreed to host a small conference to discuss neuroscience and placemaking, An Organizing Committee of Mark Hewitt (an architect working on a book on neuroscience and design), the neuroscientist Sergei Gepshtein, Sussman, and Massengale agreed on a concept for the meeting—an emphasis on inter-professional collaboration and developing criteria for experiments that could produce scientific results—and began to contact people about the event. The overwhelming reaction, even from people they had never met, was to quickly sign up. I had recently sensed a collective intelligence emerging about the fundamental role of neuroscience in architecture, and this meeting came at precisely the right moment. Everyone involved, from the organizer John Massengale, to the sponsoring organization Ax:son Johnson Foundation, to the other individuals invited, inspired confidence in me that this was going to be a very serious effort.I could not pass up the opportunity to interact with so many good people from rather different disciplines, and the attendant promise of crucial cross-fertilization of ideas. a desire to work with John Massengale and others in Engelsberg. of the opportunity join an international leadership group to introduce biology and science-based metrics into architecture and place-making. I have been exploring the convergence of science and architecture and what that will mean for science. I welcome every opportunity to deepen this exploration and to learn about other perspectives on where neuroscience and other sciences of human mind and behavior can help to improve design of the built environment. The Engelsberg meeting began late in the afternoon on Friday, September 22nd and ended in the early afternoon on Sunday, September 24th. Architect and urban designer Gianni Longo facilitated the conference. The weekend began with introductions by Elmlund and Massengale. Longo then moderated a roundtable discussion in which everyone took a few minutes to introduce themselves to the group, frequently adding information about why they had come and what they hoped to contribute or learn. Drinks, discussion, and dinner followed. The Saturday program the next day had three distinct sessions. The first focused on placemaking, with presentations by Mark Hewitt, Yodan Rofè, Ann Sussman, Daniele Quercia, and Max Martinez. The second session had the theme of measuring the urban environment: presentations by Sergei Gepshtein, Jennifer Groh, Elvira Fischer, Nikos Salingaros, and Mariela Alfonzo looked at this from the perspective of neuroscience, biophilia, and urban design. The third discussion focused on common ground and the overlap between theory and practice, with presentations by Peter Elmlund, William Browning, and Nicholas Boys Smith. Following each session, the group broke into focus groups for facilitated discussions looking at critical issues and questions. Everyone who attended in one way or another has been working for years to advance either placemaking or the understanding of place. All were happy for the opportunity to come together with others in their own field and other fields to discuss new ways to move forward. Neuroscience and architecture are converging, in new articles and books and around conferences at the Academy for Neuroscience and Architecture (ANFA)2 and the Driehaus Foundation. The content and audiences in the conferences and publications have primarily been theoretical and academic, with little practical effect to date on architecture, building, and development. Placemakers and scientists are working to develop objective and data-driven measurements to quantify what makes a place (neighborhoods, streets, buildings, rooms) great. The work has nevertheless helped develop a variety of analytical, scientific, and survey tools: Happy Maps, Feeling Maps, Apps, WalkScore, MRIs, EEG, eye tracking, virtual and enhanced realities, etc. The tools are becoming more flexible and capable of being taken outside the lab and used in the field. There is confusion about roles and responsibilities, with architects and placemakers fascinated by the science and scientists fascinated by the arts of placemaking and architecture. Not surprisingly, few scientists think that architects have a deep understanding of neuroscience. Similarly, few neuroscientists understand all the philosophies and ideologies that exist in contemporary and past architectural thought. One of the biggest obstacles to progress continues to be a lack of funding. Bringing professionals from different fields together for collaboration is expensive. The hardware and software needed are also expensive. Nevertheless, the public effect (as opposed to the effect on the architecture profession, to name just one) of this imperfect process can be impressive: front page articles in leading newspapers, op-ed opportunities, cover stories in magazines, and invitations to speak at a variety of professional conferences. There was a widely shared belief at the conference that the right information could transform both science and design. Instead of trying to teach architecture to neuroscientists, or neuroscience to architects, we need collaborations in which everyone can contribute their professional knowledge. In addition to scientists and designers, the experiments will need software, hardware, and properly trained technicians. Disruption caused by “paradigm shifts” makes for wonderful opportunities; the 21st century “Age of Biology” effectively topples 20th century architectural practice yet also provides unique circumstances for reframing the discipline. People are animal, not mechanical: primates are built for attachment and buildings and streetscapes work best when they acknowledge our mammalian predispositions such as a continual hunt for “fixation” points (that enable connection). Advertising agencies, product designers, auto designers, business school students, already all use biometrics to direct and select designs; architects need to know about this and understand the power of these tools. The summary of findable associations my team and I have been doing into links between urban form with wellbeing (and all its component elements) and value. The knowledge that Create Streets exists and is doing (I hope I can fairly) say important and useful work in the UK with a high amount of influence. I hope others will want to work with Create Streets and involve us in any joint work going forward. I presented a body of work carried out over several years, highly relevant to the topic at hand, which might not be known to every attendee. It would be great if other researchers who attended this meeting found links in their own work to what I presented, or even better, missing pieces that could help them towards answers. It was important to establish the link to earlier work carried out by Christopher Alexander, leading into my own work that supports the application of neuroscience to architecture and urbanism. (Neuro)science and architecture are divergent traditions. For productive collaboration, we need to agree about basic concepts and about questions we can pursue together. I am trying to develop such common ground. It is obvious that (neuro)science and architecture will converge. How to facilitate their convergence? How to reduce the pain? I suspect that productive collaboration will happen on a neutral territory, between the established traditions: a new domain of inquiry will emerge. Sunday had another roundtable conversation. For four hours, the group discussed what they had heard and focused on ways to collaborate, bringing together their experience and skills. Two points stood out. First, there was enormous excitement about the weekend. Everyone had looked forward to the meeting, but many found the actual event even better than they had expected. There was a strong wish to keep the group going, with more meetings or activities. Second, the group quickly came together around the idea of using the group’s skills and tools in an experiment. Much of the discussion focused on a pilot study with rigorous analytical parameters that would engage all of the scientific, theoretical, architectural, planning, and commercial skills of the group. the experiment should be on a carefully selected city block, in a location where there is potential for “private funding” and “where the city government is at least partially interested” in what the group does. The group discussed the pros and cons of conducting the test in the US, in the UK, in another European country, in Africa, and in Asia. the testing should focus on the space between the buildings, up to and including the facades and should include a variety of building types — row houses (terrace houses in the UK), mid-rise buildings, and towers—and building details—facades, materials, levels of detail. Different streetscapes and street layouts should be tested with photoshopping and/or virtual reality. to produce data-rich results, the testing should be extensive, requiring the most sophisticated equipment and expertise. Designers can create criteria for testing, scientists can determine how to test the criteria, and technicians can assist in executing and analyzing the tests. Discussing funding, the group mentioned foundations and government sources (including military funding), but the consensus was that corporate funding should be a priority, given the potential commercial value of applying scientific data to placemaking. Other topics of discussion related to a name for the group; sources of funding; when, where, and how to meet again; an amalgamation of survey tools like Happy Maps and Feeling Maps (perhaps with the addition of digital tools like the State of Place app); research and academia. More specifically, Sergei Gepshtein volunteered to create a database where anyone who collects data can upload it: “an international, open source, open data movement.” Jennifer Groh suggested a short summer course that would bring together neuroscientists and architects to learn from one another and that would focus on teaching “methods and strategies and pitfalls” in their respective fields. John Massengale talked about the pros and cons of a conference in England (“which seems to be the most fertile ground for this”) that would bring together 100 to 200 people with an agenda similar to the gathering at Engelsberg. Massengale discussed his experience with the Congress for New Urbanism, which began with an invitation-only conference for 200. That was the first annual congress. The CNU met last year for the twenty-fifth time. Most congresses have 1,100 to 1,500 attendees. Massengale also brought up his experience in architecture school with Mark Hewitt. They arrived at the Masters of Architecture program at the University of Pennsylvania soon after the death of American architectural icon Lou Kahn, in the early days of Post Modernism. Without Kahn, the faculty was in disarray (as many architecture faculties are today, for various reasons), and the students gravitated to Post Modernism, and then traditional and Classical architecture, on their own. Looking back, this was when New Urbanism and the modern Classical movement were born. Massengale believes that scientific data could bring about a similar, bottom-up transformation of architectural education today. I also agree that some empirical testing is in order, but before that we need to ask ourselves what the relevant research questions are. The neuroscientists are interested in learning how the brain works—while we are interested in what kind of architecture supports human well-being at a conscious and non-conscious levels. These are related questions, but not the same. Can we corroborate reported feeling maps with the use of the multiple sensor apparatus used by iMotion? What is the non-conscious and conscious response to different styles of architecture? Is there a difference between classical and non-classical traditional architecture? These are some immediate questions. Deeper ones may be to look at those patterns in the pattern language that have a theoretical basis in human psychology and see if we can corroborate them using experiments. Or to try to explain some of Christopher Alexander’s 15 Properties on the basis of cognitive abilities. I hope that together we can present a coherent approach to applying neuroscience to design on all scales. I believe that the diversity of our group is our strength: forging cross-links and strengthening our results to define a new practical discipline. I would like to spearhead for a complete restructuring of architectural and urban design practice, and architectural education, so as to position neuroscience at its center. Stay connected and keep the community going and growing! Happy to come up with a meet-up place in Boston or Concord, Massachusetts to facilitate organizing an event here with potentially interested others maybe at MIT and elsewhere. We should all pitch in on a collaborative piece for publication that leverages our separate locals and common concerns and celebrates our group’s uniqueness! It will be hard to keep such a physically remote group together and I would judge it is impossible without some sort of secretariat like INTBAU. We discussed this didn’t we but ideally, an international body focus on the science of architecture and urban form (AAND – Association of architecture, neuroscience and data?) – perhaps linked to CNU or INTBAU to prevent turf wars? Create Streets would be delighted to be part of and support this but I have to say in good conscience as we remain thinly funded for the immediate future that it will be hard to give serious time with identified funding. Slices or PR, coming to conferences, talking at events is doable without budget. Connection with the sciences means that every foundational idea will have to be tested. No stone will be left unturned. I would like to help doing just that. The foundational ideas I am exploring at the moment have to do with the structure of concrete space as we experience it, in contrast to the abstract mathematical space conceived by intellect. Narrow: As a recipient of the Harold Hay Research Grant from the Academy of Neuroscience for Architecture, I spent several years interacting with architects and designers of built environments, trying to appreciate where my science may help the art and technology of architectural design. I was impressed by how little modern architectural practice is informed by the sciences concerned with sensory processes and perception. And this is while many questions arising in daily practice of designers may have immediate answers in the sciences, or ready methods exist to start answering these questions. I also learned how little scientists know of where their knowledge and know-how may be useful in the wide range of disciplines involved in design of built environments, outside of the traditional clinical applications of neuroscience. As I try to imagine the roles we are going to play in this project, I think of John and Mark as the architects who will help the group to set goals for a concrete program of research and who will develop detailed responses to the ideas generated by the scientists. I value in particular the historical clarity that shines through John’s notes, and the multiple connections to architectural criticism (such as the books by Cuff and Treib) in Mark’s comments. It was wonderful to meet and interact with such an interesting group of people. I came away with a lot of excitement about the future. One of the things that I was struck by at the meeting was that architecture has the potential to be a fruitful avenue for connections between an artistic domain and a scientific one because architects have the necessary technical background to be able to partner with scientists – there will always be communication gaps but I think much less so than for my (limited) experience with visual artists. I mentioned this to the head of our Duke Institute for Brain Sciences and she immediately saw the point. With regard to testing, I agree. Would be good to do something. I would be happy to be involved in any way you would find useful. First step might be to try to define some specific questions to be asked, then discuss what measurements could be made that would address those questions. And we should take some care with planning the analysis – quite a bit of (negative) attention is being directed at some dicey practices involving various forms of priming studies (see New York Times article about Amy Cuddy and power posing). But before choosing the methods, I would definitely find it useful to be working from a specific question, hypothesis, or conjecture. This is a propitious time to bring together architecture and science. New conferences are being held: less than a week after our meeting in Engelsberg, the Driehaus Foundation held a one-day conference on neuroscience and design called “Architecture as Experience: Human Perception and the Built Environment.” New architecture schools that will be more open to the idea of listening to neuroscience begin this year: Nicholas Boys Smith is teaching at one, and Yodan Rofè is teaching at another. As he told us in Engelsberg, Sergei Gepshtein is opening a new institute at the University of Southern California, called the Center for Spatial Perception and Concrete Experience (SPaCE). New books about neuroscience and design are coming out. During the meeting, three primary areas of focus were discussed: a test on a city block; updating urban survey techniques; and specific research that complements the pragmatic, practical focus of the group. Since the meeting, there has been some progress regarding the first project. City Block Project(s): Discussions since the meeting have focused on an ambitious project in London, as well as one with smaller goals (and a smaller budget). Ideally, enough funding would be found for a single project that meets all the group’s goals. For that, a block in the city would be digitally recorded and then tested in three ways: on site (reality); in augmented reality (on site or in a studio); and in virtual reality. London seems to be the place where it will be easiest to raise money, where some team members can most easily assemble (some are already there), and where consultants and equipment are readily available. Sergei Gepshtein has raised the idea of working in Los Angeles, at his new institute at USC. Place Science staff might a full-fledged part of the SPaCE program. The institute has yet to open, however, and these options are only in early stages of discussion. Yodan Rofè argued in Sweden that Africa would be the best place to start, and of course, there are arguments for working outside the Western World. Pragmatically, at this time, London and Los Angeles seem like the easiest places to make everything work. If a foundation such as Driehaus (which likes all its projects to be in Chicago) would promise enough money, Chicago would move to number one. There is no paid staff (see more on this below), so for the moment moving the project to Africa would require that someone knows a source of funding in or for Africa. Urban Survey: Several people in the group in Engelsberg already work with mapping urban experiences and emotions produced by those experience. Yodan Rofè’s Feeling Maps are a low-tech version. Daniele Quercia’s Happy Maps are related but use digital views and mapping, computers, and algorithms in a significantly different process. Since the meeting in Engelsberg, Quercia has developed a new project, called goodcitylife. Mariela Alfonzo’s State of Place app quantifies over 290 criteria for placemaking and urbanism. Any urban survey project would most likely be a collaborative project. Funding might come from joining with a group like the Canadian team that is hoping to sign a contract in the Middle East for a large mapping project. Or perhaps the UN Habitat in Nairobi could sponsor this project, which would be less expensive than the urban block experiment. Thus far, no one has identified a source of funding. Research: Ann Sussman and Mark Hewitt have proposed a presentation at ANFA that will survey the appropriate literature and analyze recent discoveries to explain why the authors believe that ornament is necessary for all buildings and artifacts. The challenge for the research is to keep the group’s emphasis on science and reproducible data rather than theory. The earliest studies were by the sociologist William “Holly” Whyte, author of The Organization Man, who developed the “Street Life Project” for the New York City Planning Commission in the 1970s. Whyte used time-lapse photography and other methods to document the ways people used public space, publishing the results in The Social Life of Small Public Spaces and Rediscovering the Center. Later work by the mathematician Christopher Alexander that investigated the experience of place was tested in the field by Yodan Rofè, a student of Alexander’s who became one of his collaborators. The architect and urban designer Anton Nelessen developed what he called Visual Preference Surveys, which measured the public reaction to hundreds of pairs of slides to produce numeric ratings showing the popularity, or unpopularity, of different streetscapes and buildings. In the eyes of the architectural academy, all of these studies—which were intelligent attempts to bring objective insight into design—were competing and unpersuasive theories, less interesting than the tenets of conventional Modernism. The Academy of Neuroscience for Architecture has held three conferences and will have a fourth in September 2018. See http://anfarch.org/programs/conferences/. The website for the Driehaus conference has several videos of the presentations. This entry was posted in Featured, Neuroscience, Place. Bookmark the permalink. How exciting. I would love to get connected with the group. In the last few years I have done some empirical experiments on places, power places and emotions felt at these places. I would like to share my articles with you.